In Part 1 of this two-part series, we talked about how gentrification can spread via signals, using an intersection in Seattle’s rapidly changing Central District neighborhood as an example. In Part 2, we broaden our approach, using computer simulations to demonstrate how a signal—a store that draws customers from around the city, or a third-wave coffee shop—can lead to gentrification even in the absence of overt preferences or bias, or conscious beliefs about property values in an area—and how changes in house prices can actually be more dramatic in the absence of these kinds of overt beliefs. To demonstrate how this can happen, we’ll use two computer simulations that show house sales over time, one with conscious preferences, and one without. In the first simulation, some people have a strong preference for living near a useful amenity. They may also have an aversion away from other locations, whether they’re liquor stores with bulletproof glass or people of a different nationality. In the second, the people bidding on houses have no serious desire to live next to the amenity and no concern about race at all, but everybody knows that there are other people, somewhere, who do. It is the second simulation—the one where overt preferences don’t exist—where we really see home values shift in both directions. These simulations take place in a town we’ll call Squareville, where houses are neatly laid out on a grid. When Squareville was built, all the houses were identical, so each buyer bought a house from the builders for $100. Every year, ten houses go up for sale, and there are always three bidders on every house. Bidders’ bids are a bell curve centered on the average of the last sale price of the surrounding houses. In Vladimir Nabokov’s Pale Fire, a poet suffers great angst when the house next door is rented to a migrant from the fictitious country of Zembla. So in our first simulation, let’s move some Zemblans into a block of Northeast Squareville, a town where half of the residents, like Nabokov, are zemblophobes. If a zemblophobe is bidding on a house adjacent to a Zemblan, they will bid 20 percent less. There is also an excellent bakery in the southwest, which is a delight to walk to. Here, half of bidders on houses adjacent to the bakery will bid 20 percent more. How Does Overt Prejudice Affect Home Prices? Using these parameters, we simulated 250 periods of selling, buying, and bidding, and the plot in Figure 1 shows the result. Darker colors indicate higher house prices, and they are clearly higher around the bakery in the southwest (represented by the green circle)—and not just immediately adjacent, but for a few blocks in all directions, as higher sale prices near the bakery cascade to higher-priced sales down the street. Around the Zemblan block to the northeast (represented by the green triangle), prices do not get much out of line with other neighborhoods in Squareville outside the trendy southwest, and any occasional dips do not spread out. After all, the high bidder wins every auction, so if a zemblophobe is bidding lower than typical, the odds are good that a non-zemblophobe with a not-depressed bid will win the house. What If No One Is Actually Prejudiced? In the second simulation, there are no actual zemblophobes, but no individual Squarevillian can know for sure that this is the case. In this simulation, every bidder is concerned about what their fellow Squarevillians are thinking. When bidding on a house by the Zemblan block (the green triangle), they consider the possibility that some of the bidders may be zemblophobes. To keep things simple, bidders will assume one of the competitors is a zemblophobe who won’t place a competitive bid, meaning only two serious bidders instead of three. Applying some game theory, bidders on a house adjacent to a Zemblan block lower their bids by 15 percent. Across town, a trendy pot shop (the green circle) opens up. Everyone in Squareville knows hipsters think it’s cool to live next to a pot shop, so bidders on nearby houses expect that there is some chance that competing bidders are hipsters who will bid higher for the choice location. Expecting competition from enthusiastic hipsters, bidders on a property by the pot shop raise their bid by 15 percent. As outsiders, we know there are no hipsters in Squareville. But that doesn’t matter—in our simulation, everyone thinks that there may be high-bidding hipsters competing for houses near the pot shop, so the price around the pot shop goes up anyway. The plot in Figure 2 shows the result of a simulation over 250 periods using these rules. The effect of perceived zemblophobia is greater than the effect of actual zemblophobia in our first simulation. In other words: the fact that people believe others think Zemblans are bad for property values causes that assertion to be factually true. Meanwhile, the effect on prices around the pot shop is similar to the effect of the bakery—even in the absence of any high-bidding hipsters. The beauty contest makes the problems of perceived markers of lower and higher neighborhood value especially ingrained. We can’t just flip a switch and say, “Okay, redlining is over; no more discrimination”—or “hipsters are over; no more gentrification.” Even if nobody actually believes that Zemblans are bad for property values, or that hipsters are good for housing prices, as long as there are people who erroneously think people with those beliefs exist, we’re off to the races and the beauty contest argument applies. Let’s step away from housing for a second, and consider a hiring manager making an offer to a job candidate. Comparable to bidding on a house, the hiring manager’s bid for the candidate’s salary depends on what she imagines other bidders are thinking. Taking the color of the candidate’s skin as a signal, she may expect that other bidders will bid lower for this candidate. Then she can adjust her bid down a little, under the assumption that there is less competitive pressure to bid top dollar. She has a correct assessment of what the candidate is worth and does not devalue him because of his physical features, she bears no animosity and expects none from coworkers, and yet she makes a lower bid anyway. And if everybody else makes the same assumptions, then her odds of winning the candidate are not dashed by her underbid. The inverse of this process—gentrification—is also about expectations: one pot shop does not make a wave of anything, but if that shop creates the perception among a large population that further change is coming, that perception can be self-fulfilling. But isn’t the market self-correcting? If a supermarket charges too much or too little for apples, the manager can check the supply in the bin at the end of the day and adjust prices tomorrow accordingly. There is a functional value to an apple, which can be compared to the functional value of other fruits. The problem is that the value of property is only partly for the functional use of shelter, and partly as a store of value and a bet: If I am confident that I can sell a house for $1.5 million in a few years, then it’s a profitable bet for me to pay $1 million now, regardless of the market price of the components that make up a house. It’s a beauty contest game again: if I expect the neighborhood will be “hot” in ten years, then paying more than what it would cost to build a house in a cheaper area is a rational bet that the market will reward me for. If I expect institutional racism to persist ten years into the future, then the “correct” bid in a Zemblan neighborhood will be lower than the bid on an identical house in the “hot” neighborhood. A buyer buying a property in the Zemblan neighborhood today has to consider what the market will look like when she sells. If she expects that it will be selling to zemblophobes in the future, she has to lower her bid now accordingly. As long as perceptions remain constant, taking those perceptions into account when bidding is the market-correct thing to do. And It certainly doesn’t help that the grocer can check the apple bin every few hours, while buyers won’t get feedback in the form of a future sale for maybe a decade down the road. In the first example with actual zemblophobes, some people bid lower on houses in one neighborhood, but others placed an “objective” bid based on market conditions—and it’s the high bidder who wins, so a real change in prices was difficult to observe. This is the story of the free market smoothing over imperfections: if people bid below the accepted norms because of personal biases, they lose. But even in the absence of overt racism, a population of indifferent people who modify their bids according to the belief that others expect a norm of racism, could be sufficient to explain some of the patterns we observe. After a major trauma, the free market continues to show scars for decades. Redlining has been gone for about half a century, Realtors are now monitored to limit their ability to steer people based on race, and the banking system continues to make progress toward fair lending, but all of those issues we want to think of as done with and healed continue to set our expectations for how the market will behave in the present day. And those expectations are self-perpetuating. Similarly, the positive signal that radiates out from a fancy pot shop (or bakery, or cocktail lounge) reverberates to tell future homebuyers what a neighborhood will look like in two or five years—and this understanding, once it is recorded in property sale deeds, can also become self-perpetuating. In the real world, of course, gentrifying neighborhoods are considered “gentrifying” precisely because they were once populated primarily by low-income people and people of color. So there must, in theory, be some point at which the two competing impulses described above—beliefs, or beliefs in the existence of beliefs, that stigmatize certain neighborhoods, and beliefs that lead gentrifiers to think, “This neighborhood has become a place for people like me”—tip toward or away from gentrification. In other words, there has to be a reason some neighborhoods with similar qualities gentrify and others don’t. There are no easy answers to this question. However, we can demonstrate both of these possible scenarios (the pot shop/bakery/cat cafe that tips a neighborhood into gentrification and the one that doesn’t) using two more simulations. In the first (Figure 3), we move the spot that is perceived to raise values and the spot that’s perceived to lower values into the same neighborhood in the center of town, with the pot shop just to the west and the zemblans just to the east. It’s rarely just one building that people perceive (read: perceive that others perceive) as desirable. If a neighborhood looks like it doesn’t have a lot of money, then bidders may not want to live there as much, causing a feedback loop where lower-income neighborhoods stay that way. One could imagine a similar feedback loop in ritzier areas, where money attracts amenities which make home values worth even more. In this simulation, bidders take these things into account and bid higher or lower if a neighborhood is already especially high- or low-value. This leads to an unstable situation: a perfect balance is almost impossible, and a minor change in conditions can lead to a major change in outcomes. As time goes by, the higher home values represented by darker colors take over, and the lower-priced squares drift to the east. The second simulation in this set (Figure 4) shows that this doesn’t always happen. In this simulation, bidders don’t expect as much from a pot shop. In the first set of simulations, bidders increased their bid by 15 percent for squares adjacent to the shop. In this set, we’ll lower that to an increase of just 5 percent. When we make this change, the entire story is different. The center of town remains a low-priced area, and the boom in prices we saw in the previous simulation doesn’t materialize at all. 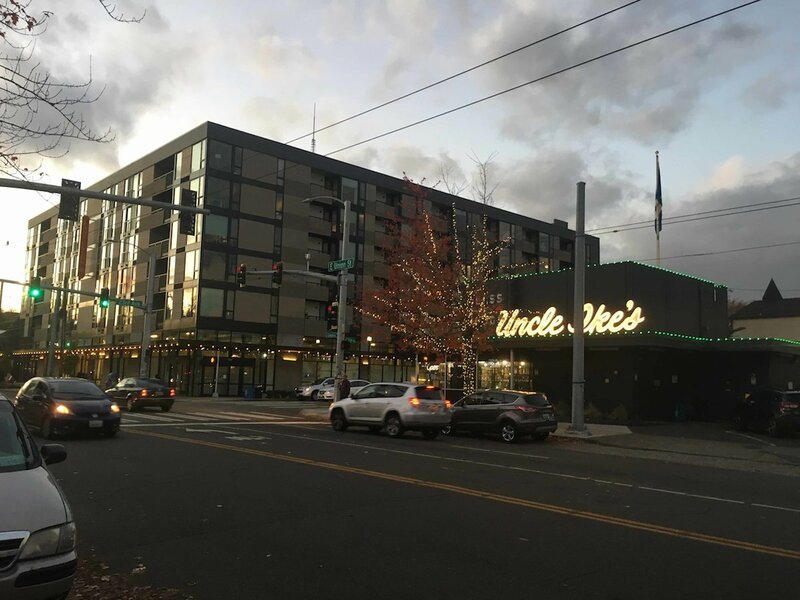 As of this writing, here’s what’s happening at 23rd and Union in Seattle: Businesses are starting to move in to the ground floor of another new apartment building across called The Stencil, where one-bedrooms start at $2,400 a month. The strip mall across from Uncle Ike’s, Midtown Center, will soon be the site of a new 429-unit apartment complex. And, just east of the Neighbor Lady, another six-story apartment box—located at the historic site of the first bank west of the Mississippi to serve the African American community, Liberty Bank—is about to open. This one, however, is a little different. It’s being developed by a partnership of community groups, including Africatown, and its 115 apartments will be affordable, with rents starting at just $526 a month. A special phone line, set up for prospective tenants, went live at 9 a.m. on November 1st.